Tshepy Boutique is a high-end, quality handbag brand – founded in 2014 by Tshepiso Sethare with the aim of addressing a need in the South African accessories market. As the lead digital agency Tshepy Boutique, we were responsible for invigorating the brand within the hearts and minds of South African women with a distinct elegance and inclination for supreme value. Tshepy Boutique had successfully established an exclusive client base that recognised the value of the brand and actively sought to acquire a Tshepy Boutique handbag. As the brand’s awareness continued to grow, largely through word-of-mouth, it became more-and-more important that the brand become accessible to current and potential customers who took action in finding a handbag or learning more about the brand. We wanted to create a platform that, not only fostered and encouraged conversation but also improved convenience and efficiency. While Tshepy Boutique was well known amongst their clients and admirers, the brand was missing out on the opportunity to broaden awareness and significantly impact the client base. We sought to evolve current customers into inspiring influencers and brand ambassadors who not only talked about the brand but shared. An e-commerce website that went beyond simply showcasing the attractive handbags. We mapped out an astute online customer journey that would guide users in taking desirable actions. Audiences were navigated through CI and brand stationary, social and user-created content, as well as the website. All the designs were done with elegant inspiration taken into account. The client was very pleased with the logo and CI design, noting that it was reflective of the perfect marriage of global and local trends. The brand’s quality and sophistication was consistently communicated across platforms and imagery. 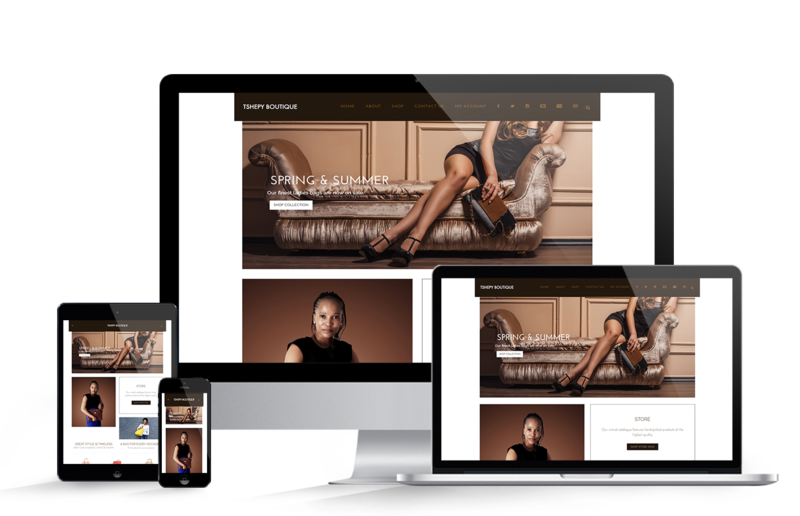 The e-commerce website we created not only provided an alternative platform for customers but it was prudently optimised, which saw it achieve a significant percentage of purchase. The website was also designed to improve convenience and increase customer value.